After the release of Automata II, their 9th full-length record, Between The Buried And Me has just announced that they’re due to set sail on a North American tour to promote their latest record, in which they would be accompanied by Tesseract and Astronoid. Ever since they dropped their newest album, BTBAM have focused mostly on promoting Automata II, performing in various locations, both in America (including the annual Summer Slaughter tour) and in Europe. In other news, the band marked its name in the history pages, and it had very little to do with their music: a fossil of a newly discovered species was named after the band. Really, you can read all about it, here. In the meanwhile, enjoy Blake Richardson’s live drum playthrough of “Voice of Trespass” off Automata II (we also reviewed the album. You can read all about it here). Tesseract also kept themselves busy: similar to BTBAM, they conquered plenty of stages throughout Europe, in aim of promoting the band’s 4th studio album, Sonder, released earlier this year via Kscope. Three weeks ago, they dropped a brand new music video for “Juno”. Also, feel free to check out our interview with Randy Slaugh, where we explored the behind the scenes of the choir recording session for Sonder. And in regard to Astronoid? Well, the Groveland, MA based outfit also had a busy schedule lately, returning from a 4 weeks long tour with Zeal and Andor in the U.S, which followed a 5-week journey with Tesseract and Plini. It seems that these guys are in great performing shape, and a solid addition to complete the lineup for the upcoming tour that is due to start off on February 8, as the final act will take place on March 10. 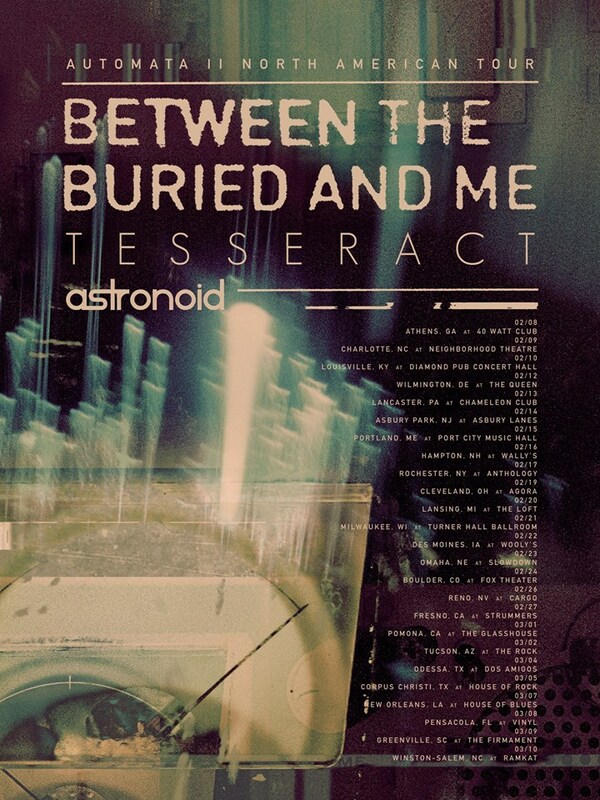 Make sure to follow Between The Buried And Me, Tesseract and Astronoid for further information and updates. Next PostHorizon Ablaze Keep the Fire Burning With New EP "Di Inferi"